A follow-up of incidentally noted and untreated os odontoideum, even with C1-C2 subluxation. The age at diagnosis varies significantly from the first to the sixth decade of life. With increased awareness, however, os odontoideum has been diagnosed in younger patients. While the etiology remains controversial, an increased frequency of os odontoideum has been reported in patients with Morquio syndrome, [8, 9] multiple epiphyseal dysplasia, and Down syndrome. Successful treatment of os odontoideum requires an understanding of the unique anatomic characteristics of the cervicocranium (occiput-C2). The bony elements here develop through enchondral ossification. The axis has 5 primary and 2 secondary ossification centers. C0, C1, and C2 sclerotomes contribute to various portions of the dens. 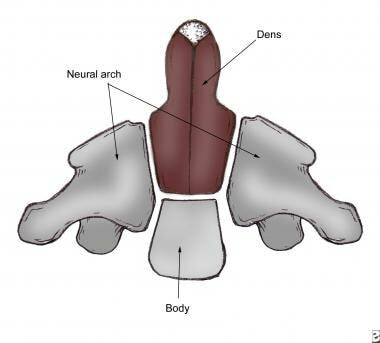 The principal portion of the dens body arises from the original center of C1. The vertebral arteries are intricately invested in the bony anatomy of the atlantoaxial segment. They pass just inferior to the C1-C2 facet joint, then course laterally through the transverse foramen of C2. Just above the C1 lateral mass, they turn medially and meet to progress cephalad into the foramen magnum. Aberrancy of the vertebral artery course is not rare and may limit fixation options in some patients selected for operative management of os odontoideum. This deviant course may be unilateral or bilateral. Differentiation between os odontoideum and persistent ossiculum terminale is clinically critical. The ossicle of the ossiculum terminale is much smaller than that of the os odontoideum. More important, that ossicle lies at the level of the atlantal ring above the transverse atlantal ligament. In this cranial location, ossiculum terminale, unlike os odontoideum, is not associated with significant instability. In this model, os odontoideum develops gradually. Following a fracture of the odontoid synchondrosis, with growth, the alar ligaments carry the dens fragment away from the axis base. The cranial portion of the dens fragment continues to receive a blood supply from the vascular arcade. The avascular caudad portion resorbs, leaving the characteristic rounded ossicle. Authors who favor a congenital basis for os odontoideum point out that the craniovertebral junction is one of the most common sites for malformation. Included are clefts or aplasia of anterior and posterior arches of atlas. [15, 18, 19, 26] On the other hand, unlike most congenital malformations, os odontoideum tends to occur as an isolated entity without other regional anomalies. Garg et al reported a case of os odontoideum in a myelopathic 16-year-old patient with bipartite atlas. They concluded that coexistence of these conditions support the embryologic basis for os odontoideum. In this case, the dens had an “unusual bony projection” on its anterior surface. Regardless of the underlying cause, sound treatment selection requires an understanding of the natural history of this process. It is known that in a subset of patients, the secondary ligamentous restraints become lax. With increasing laxity, anterior motion of the atlas on the axis can become excessive. When the instability has been longstanding, it becomes multidirectional. Less clear are the percentages and rates of progression to instability. As no population studies are available, assumptions are made from case series data of nonoperatively managed patients. Two types of os odontoideum are described, based on the position of the dens tip: orthotopic and dystopic os odontoideum. In the orthotopic type, the dens fragment lies in an anatomic position. In dystopic os odontoideum, the dens tip is in any other position. Most commonly, the fragment is located near the foramen magnum, where it may fuse with the clivus. Alternatively, the os may be fixed to the anterior ring of the atlas. Subluxation and instability are described in both types of os odontoideum. Some authors believe that dystopic os odontoideum is more likely to be symptomatic. In years to come, both posttraumatic and congenital forms of os odontoideum may be identified. Today, however, authors in each camp often write as if their hypothesis has been all but proved. Understanding the true etiology of this disorder may be helpful in terms of identifying high-risk patients through genetic testing. If os odontoideum is posttraumatic, the increased use of advanced imaging modalities such as spiral CT and MRI may markedly decrease its incidence in the future. Furthermore, better explication of the etiology may better delineate progression risk, leading to decreased x-ray exposure during follow-up and the limiting of operative intervention only to those patients at high risk for progression. These data may also support or eliminate the need for activity restriction during the observation phase. Klimo et al investigated 77 patients with os odontoideum who underwent surgical stabilization. In all patients, fusion was achieved at a mean duration of 4.8 months. Ninety percent of patients reported improvement in their neck pain or neurologic symptoms. Furthermore, it was reported that 39% of the patients who presented with myelopathy had complete resolution, 50% showed improvement in their spasticity, and 11% constant and unchanged spasticity. The neurologic outcome in patients with symptomatic cord compression is less clear. After surgery, typically, symptomatic progression ceases and most patients report significant symptomatic improvement. These patients can be divided into those with acute, incomplete cord syndromes and those with more insidious myelopathic syndromes. Typically, transient neurologic signs following trauma is associated with a good prognosis. Rapid functional return parallels improvement in neurologic signs, and recurrence rates are low. A retrospective study of 21 patients treated with rigid, posterior instrumentation showed a mean improvement in the Nurick scale for myelopathy of 2.3 before surgery to 0.7 at the time of follow-up. At a mean 34.7 months of follow-up, Odom's criteria outcomes were excellent in 47%, good in 37%, fair in 11%, and poor in 5%. All patients with preoperative neck pain had symptom relief or improvement, with all of these patients having more than 83.7% improvement in visual analogue scale scores. The authors reported a mean improvement in space available for cord from 9.3 mm to 17.7 mm. There were no pseudarthroses or screw failures. Patients with cerebellar or medullary signs exhibit a more progressive course. In that these patients gradually worsen, surgery is most clearly indicated in this setting. Perrini P, Montemurro N, Iannelli A. The contribution of Carlo Giacomini (1840-1898): the limbus Giacomini and beyond. Neurosurgery. 2013 Mar. 72(3):475-81; discussion 481-2. [Medline]. Klimo P Jr, Kan P, Rao G, Apfelbaum R, Brockmeyer D. Os odontoideum: presentation, diagnosis, and treatment in a series of 78 patients. J Neurosurg Spine. 2008 Oct. 9 (4):332-42. [Medline]. Jumah F, Alkhdour S, Mansour S, He P, Hroub A, Adeeb N, et al. Os Odontoideum: A Comprehensive Clinical and Surgical Review. Cureus. 2017 Aug 8. 9 (8):e1551. [Medline]. [Full Text]. Karmakar PS, Karmakar PS, Mitra R, Basu S, Ghosh A. Sudden onset quadriparesis after minor injury to neck in a male with OS odontoideum. J Assoc Physicians India. 2013 Feb. 61(2):138-9. [Medline]. Graillon N, Rakotozanani P, Graillon T, Dufour H, Fuentes S. [Acute decompensation of os odontoideum in the elderly. Case report]. Neurochirurgie. 2013 Aug-Oct. 59(4-5):195-7. [Medline]. Perdikakis E, Skoulikaris N. The odontoid process: various configuration types in MR examinations. Eur Spine J. 2014 May. 23(5):1077-83. [Medline]. Hadley MN, Walters BC, Grabb PA, Oyesiku NM, Przybylski GJ, Resnick DK, et al. Os odontoideum. Neurosurgery. 2002 Mar. 50 (3 Suppl):S148-55. [Medline]. Lipson SJ. Dysplasia of the odontoid process in Morquio's syndrome causing quadriparesis. J Bone Joint Surg Am. 1977 Apr. 59 (3):340-4. [Medline]. Stevens JM, Kendall BE, Crockard HA, Ransford A. The odontoid process in Morquio-Brailsford's disease. The effects of occipitocervical fusion. J Bone Joint Surg Br. 1991 Sep. 73 (5):851-8. [Medline]. McRae D. The significance of abnormalities of the cervical spine. AJR. 84:3-25. LaBagnara M, Sure DR, Smith JS, Shaffrey CI. Anatomy and physiology of congenital spine lesions. Steinmetz MP, Benzel EC, eds. Benzel's Spine Surgery: Techniques, Complication Avoidance and Management. 4th ed. Philadelphia: Elsevier; 2017. Vol 1: 142-52. O'Rahilly R, Müller F, Meyer DB. The human vertebral column at the end of the embryonic period proper. 2. The occipitocervical region. J Anat. 1983 Jan. 136 (Pt 1):181-95. [Medline]. Dlouhy BJ, Policeni BA, Menezes AH. Reduction of atlantoaxial dislocation prevented by pathological position of the transverse ligament in fixed, irreducible os odontoideum: operative illustrations and radiographic correlates in 41 patients. J Neurosurg Spine. 2017 Jul. 27 (1):20-28. [Medline]. Yukata K, Katoh S, Sairyo K, Matsui Y, Hamada Y, Yasui N. Os odontoideum in achondroplasia: a case report. J Pediatr Orthop B. 2008 Mar. 17 (2):103-5. [Medline]. Bassett F, Goldner JL. Aplasia of the odontoid process. J Bone Joint Surg. 1968. 50A:833-4. Chang H, Park JB, Kim KW, Choi WS. Retro-dental reactive lesions related to development of myelopathy in patients with atlantoaxial instability secondary to Os odontoideum. Spine (Phila Pa 1976). 2000 Nov 1. 25 (21):2777-83. [Medline]. Fielding JW, Griffin PP. Os odontoideum: an acquired lesion. J Bone Joint Surg Am. 1974 Jan. 56 (1):187-90. [Medline]. GWINN JL, SMITH JL. Acquired and congenital absence of the odontoid process. Am J Roentgenol Radium Ther Nucl Med. 1962 Sep. 88:424-31. [Medline]. Hawkins RJ, Fielding JW, Thompson WJ. Os odontoideum: congenital or acquired. A case report. J Bone Joint Surg Am. 1976 Apr. 58 (3):413-4. [Medline]. Morgan MK, Onofrio BM, Bender CE. Familial os odontoideum. Case report. J Neurosurg. 1989 Apr. 70 (4):636-9. [Medline]. Stillwell WT, Fielding JW. Acquired os odontoideum. A case report. Clin Orthop Relat Res. 1978 Sep. 135:71-3. [Medline]. Arvin B, Fournier-Gosselin MP, Fehlings MG. Os odontoideum: etiology and surgical management. Neurosurgery. 2010 Mar. 66 (3 Suppl):22-31. [Medline]. WOLLIN DG. THE OS ODONTOIDEUM. SEPARATE ODONTOID PROCESS. J Bone Joint Surg Am. 1963 Oct. 45:1459-71. [Medline]. Hukuda S, Ota H, Okabe N, Tazima K. Traumatic atlantoaxial dislocation causing os odontoideum in infants. Spine (Phila Pa 1976). 1980 May-Jun. 5 (3):207-10. [Medline]. Kuhns LR, Loder RT, Farley FA, Hensinger RN. Nuchal cord changes in children with os odontoideum: evidence for associated trauma. J Pediatr Orthop. 1998 Nov-Dec. 18 (6):815-9. [Medline]. Brecknell JE, Malham GM. Os odontoideum: report of three cases. J Clin Neurosci. 2008 Mar. 15 (3):295-301. [Medline]. Schuler TC, Kurz L, Thompson DE, Zemenick G, Hensinger RN, Herkowitz HN. Natural history of os odontoideum. J Pediatr Orthop. 1991 Mar-Apr. 11 (2):222-5. [Medline]. Menezes AH. Craniocervical developmental anatomy and its implications. Childs Nerv Syst. 2008 Oct. 24 (10):1109-22. [Medline]. White IK, Mansfield KJ, Fulkerson DH. Sequential imaging demonstrating os odontoideum formation after a fracture through the apical odontoid epiphysis: case report and review of the literature. Childs Nerv Syst. 2013 Nov. 29(11):2111-5. [Medline]. McHugh BJ, Grant RA, Zupon AB, DiLuna ML. Congenital os odontoideum arising from the secondary ossification center without prior fracture. J Neurosurg Spine. 2012 Dec. 17(6):594-7. [Medline]. Zygourakis CC, Cahill KS, Proctor MR. Delayed development of os odontoideum after traumatic cervical injury: support for a vascular etiology. J Neurosurg Pediatr. 2011 Feb. 7(2):201-4. [Medline]. Garg A, Gaikwad SB, Gupta V, Mishra NK, Kale SS, Singh J. Bipartite atlas with os odontoideum: case report. Spine (Phila Pa 1976). 2004 Jan 15. 29(2):E35-8. [Medline]. Mintken PE, Metrick L, Flynn TW. Upper cervical ligament testing in a patient with os odontoideum presenting with headaches. J Orthop Sports Phys Ther. 2008 Aug. 38 (8):465-75. [Medline]. Crockard HA, Stevens JM. Craniovertebral junction anomalies in inherited disorders: part of the syndrome or caused by the disorder?. Eur J Pediatr. 1995 Jul. 154 (7):504-12. [Medline]. Sankar WN, Wills BP, Dormans JP, Drummond DS. Os odontoideum revisited: the case for a multifactorial etiology. Spine (Phila Pa 1976). 2006 Apr 20. 31(9):979-84. [Medline]. Wang S, Wang C. Familial dystopic os odontoideum: a report of three cases. J Bone Joint Surg Am. 2011 May 4. 93(9):e44. [Medline]. Hoh DJ, Maya M, Jung A, Ponrartana S, Lauryssen CL. Anatomical relationship of the internal carotid artery to C-1: clinical implications for screw fixation of the atlas. J Neurosurg Spine. 2008 Apr. 8(4):335-40. [Medline]. Hong JT, Yi JS, Kim JT, Ji C, Ryu KS, Park CK. Clinical and radiologic outcome of laminar screw at C2 and C7 for posterior instrumentation--review of 25 cases and comparison of C2 and C7 intralaminar screw fixation. World Neurosurg. 2010 Feb. 73 (2):112-8; discussion e15. [Medline]. Spierings EL, Braakman R. The management of os odontoideum. Analysis of 37 cases. J Bone Joint Surg Br. 1982. 64 (4):422-8. [Medline]. Dai L, Yuan W, Ni B, Jia L. Os odontoideum: etiology, diagnosis, and management. Surg Neurol. 2000 Feb. 53 (2):106-8; discussion 108-9. [Medline]. De Iure F, Donthineni R, Boriani S. Outcomes of C1 and C2 posterior screw fixation for upper cervical spine fusion. Eur Spine J. 2009 Jun. 18 Suppl 1:2-6. [Medline]. Weng C, Tian W, Li ZY, Liu B, Li Q, Wang YQ, et al. Surgical management of symptomatic os odontoideum with posterior screw fixation performed using the magerl and harms techniques with intraoperative 3-dimensional fluoroscopy-based navigation. Spine (Phila Pa 1976). 2012 Oct 1. 37(21):1839-46. [Medline]. Fielding JW, Hensinger RN, Hawkins RJ. Os Odontoideum. J Bone Joint Surg Am. 1980 Apr. 62 (3):376-83. [Medline]. Zussman BM, Saldua NS, Harrop JS. Cervical instability presenting as thoracic pain: case report and literature review. J Spinal Cord Med. 2012 Mar. 35(2):125-7. [Medline]. [Full Text]. Dyck P. Os odontoideum in children: neurological manifestations and surgical management. Neurosurgery. 1978 Mar-Apr. 2 (2):93-9. [Medline]. ROWLAND LP, SHAPIRO JH, JACOBSON HG. Neurological syndromes associated with congenital absence of the odontoid process. AMA Arch Neurol Psychiatry. 1958 Sep. 80 (3):286-91. [Medline]. Watanabe M, Toyama Y, Fujimura Y. Atlantoaxial instability in os odontoideum with myelopathy. Spine (Phila Pa 1976). 1996 Jun 15. 21 (12):1435-9. [Medline]. Bhatnagar M, Sponseller PD, Carroll C 4th, Tolo VT. Pediatric atlantoaxial instability presenting as cerebral and cerebellar infarcts. J Pediatr Orthop. 1991 Jan-Feb. 11 (1):103-7. [Medline]. Sasaki H, Itoh T, Takei H, Hayashi M. Os odontoideum with cerebellar infarction: a case report. Spine (Phila Pa 1976). 2000 May 1. 25 (9):1178-81. [Medline]. Campbell E, Brown J. Case report of os odontoideum causing Ondine's curse. Br J Neurosurg. 2013 Dec. 27(6):836-7. [Medline]. Minderhoud JM, Braakman R, Penning L. Os odontoideum, clinical, radiological and therapeutic aspects. J Neurol Sci. 1969 May-Jun. 8 (3):521-44. [Medline]. Satte A, Ech-Cherif El Kettani N, El Quessar A, El Hassani MR, Chakir N, Boukhrissi N, et al. [Os odontoideum: clinical and radiological aspects]. Rev Neurol (Paris). 2008 Feb. 164 (2):177-80. [Medline]. Surov A, Hess S, Spielmann RP, Kunze C. A delayed diagnosis of an unstable os odontoideum. Eur J Med Res. 2008 Mar 31. 13 (3):136-8. [Medline]. Aksoy FG, Gomori JM. Symptomatic cervical synovial cyst associated with an os odontoideum diagnosed by magnetic resonance imaging: case report and review of the literature. Spine (Phila Pa 1976). 2000 May 15. 25 (10):1300-2. [Medline]. Hughes TB Jr, Richman JD, Rothfus WE. Diagnosis of Os odontoideum using kinematic magnetic resonance imaging. A case report. Spine (Phila Pa 1976). 1999 Apr 1. 24 (7):715-8. [Medline]. Shellock FG. Functional assessment of the joints using kinematic magnetic resonance imaging. Semin Musculoskelet Radiol. 2003 Dec. 7 (4):249-76. [Medline]. Mackenzie WG, Dhawale AA, Demczko MM, Ditro C, Rogers KJ, Bober MB, et al. Flexion-extension cervical spine MRI in children with skeletal dysplasia: is it safe and effective?. J Pediatr Orthop. 2013 Jan. 33 (1):91-8. [Medline]. Yamazaki M, Okawa A, Furuya T, Sakuma T, Takahashi H, Kato K, et al. Anomalous vertebral arteries in the extra- and intraosseous regions of the craniovertebral junction visualized by 3-dimensional computed tomographic angiography: analysis of 100 consecutive surgical cases and review of the literature. Spine (Phila Pa 1976). 2012 Oct 15. 37 (22):E1389-97. [Medline]. Lee SH, Kim ES, Eoh W. Posterior C1-2 fusion using a polyaxial screw/rod system for os odontoideum with bilateral persistence of the first intersegmental artery. J Neurosurg Spine. 2011 Jan. 14 (1):10-3. [Medline]. Holly LT, Isaacs RE, Frempong-Boadu AK. Minimally invasive atlantoaxial fusion. Neurosurgery. 2010 Mar. 66 (3 Suppl):193-7. [Medline]. Lü G, Passias PG, Li G, Kozanek M, Rehak L, Wood KB, et al. Endoscopically assisted anterior release and reduction through anterolateral retropharyngeal approach for fixed atlantoaxial dislocation. Spine (Phila Pa 1976). 2010 Mar 1. 35 (5):544-51. [Medline]. Ni B, Zhu Z, Zhou F, Guo Q, Yang J, Liu J, et al. Bilateral C1 laminar hooks combined with C2 pedicle screws fixation for treatment of C1-C2 instability not suitable for placement of transarticular screws. Eur Spine J. 2010 Aug. 19 (8):1378-82. [Medline]. Hensinger RN. Congenital anomalies of the cervical spine. Herkowitz HN, Garfin SR, Balderston RA, et al, eds. The Spine. Philadelphia: Lippincott-Raven; 1999. 242-3. Hensinger RN. Osseous anomalies of the craniovertebral junction. Spine (Phila Pa 1976). 1986 May. 11 (4):323-33. [Medline]. Hensinger RN, Fielding JW, Hawkins RJ. Congenital anomalies of the odontoid process. Orthop Clin North Am. 1978 Oct. 9 (4):901-12. [Medline]. Congenital anomalies of the cervical spine. An H, ed. Principles and Techniques of Spine Surgery. Philadelphia: Lippincott Williams & Wilkins; 1997. 165. Callahan RA, Lockwood R, Green B. Modified Brooks fusion for an os odontoideum associated with an incomplete posterior arch of the atlas. A case report. Spine (Phila Pa 1976). 1983 Jan-Feb. 8 (1):107-8. [Medline]. Goel A, Laheri V. Plate and screw fixation for atlanto-axial subluxation. Acta Neurochir (Wien). 1994. 129 (1-2):47-53. [Medline]. Stulík J, Vyskocil T, Sebesta P, Kryl J. [Harms technique of C1-C2 fixation with polyaxial screws and rods]. Acta Chir Orthop Traumatol Cech. 2005. 72 (1):22-7. [Medline]. Park J, Huhn SL, Lee M, Kim DH, Edwards MSB. Pediatric C1-C2 anomaly: a definitive surgical option without a halo or occipital fusion. Neurosurgery. 2005 Aug 1. 57 (2):437. Haque A, Price AV, Sklar FH, Swift DM, Weprin BE, Sacco DJ. Screw fixation of the upper cervical spine in the pediatric population. Clinical article. J Neurosurg Pediatr. 2009 Jun. 3 (6):529-33. [Medline]. Lamas E, Estévez J, Castillo R, Esparza J. Os odontoideum removed by a transoral approach. Surg Neurol. 1977 May. 7 (5):312-4. [Medline]. Laus M, Pignatti G, Malaguti MC, Alfonso C, Zappoli FA, Giunti A. Anterior extraoral surgery to the upper cervical spine. Spine (Phila Pa 1976). 1996 Jul 15. 21 (14):1687-93. [Medline]. Chang H, Park JB, Kim KW. Synovial cyst of the transverse ligament of the atlas in a patient with os odontoideum and atlantoaxial instability. Spine (Phila Pa 1976). 2000 Mar 15. 25 (6):741-4. [Medline]. Wu X, Wood KB, Gao Y, Li S, Wang J, Ge T, et al. Surgical strategies for the treatment of os odontoideum with atlantoaxial dislocation. J Neurosurg Spine. 2018 Feb. 28 (2):131-139. [Medline]. Bach CM, Arbab D, Thaler M. Treatment strategies for severe C1C2 luxation due to congenital os odontoideum causing tetraplegia. Eur Spine J. 2013 Jan. 22(1):29-35. [Medline]. [Full Text]. Ebraheim NA, Xu R, Ahmad M, Heck B. The quantitative anatomy of the vertebral artery groove of the atlas and its relation to the posterior atlantoaxial approach. Spine (Phila Pa 1976). 1998 Feb 1. 23(3):320-3. [Medline]. Elliott RE, Kang MM, Smith ML, Frempong-Boadu A. C2 nerve root sectioning in posterior atlantoaxial instrumented fusions: a structured review of literature. World Neurosurg. 2012 Dec. 78(6):697-708. [Medline]. Juhl M, Seerup KK. Os odontoideum. A cause of atlanto-axial instability. Acta Orthop Scand. 1983 Feb. 54 (1):113-8. [Medline]. Taggard DA, Menezes AH, Ryken TC. Treatment of Down syndrome-associated craniovertebral junction abnormalities. J Neurosurg. 2000 Oct. 93 (2 Suppl):205-13. [Medline]. Smith MD, Phillips WA, Hensinger RN. Fusion of the upper cervical spine in children and adolescents. An analysis of 17 patients. Spine (Phila Pa 1976). 1991 Jul. 16 (7):695-701. [Medline]. Bogaerde MV, Viaene P, Thijs V. Iatrogenic perforation of the internal carotid artery by a transarticular screw: an unusual case of repetitive ischemic stroke. Clin Neurol Neurosurg. 2007 Jun. 109(5):466-9. [Medline]. Zhang Z, Zhou Y, Wang J, Chu T, Li C, Ren X, et al. Acute traumatic cervical cord injury in patients with os odontoideum. J Clin Neurosci. 2010 Oct. 17 (10):1289-93. [Medline]. A coronal reconstruction of an orthotopic os odontoideum. Note the wide gap between the rounded ossicle and the base of the axis. A sagittal reconstruction of a CT scan demonstrating a dystopic os odontoideum. Note that the ossicle appears fused to the clivus (anterior portion of the foramen magnum). Also note the smooth corticated border of the ossicle. Anterior-posterior tomogram view of a type II dens fracture. The fracture line is narrow and lower on the waist of the dens, unlike the fracture line of an os odontoideum. No cortication is noted along the fracture line. Flexion lateral radiograph of a dystopic displaced os odontoideum. Note the limited posterior interval between the dens and the posterior C1 ring (PADI). This patient had reported electric shocks radiating down the body (ie, Lhermitte sign), as well as progressive weakness and ataxia. Extension lateral radiograph of a dystopic displaced os odontoideum. This deformity did not reduce with extension. T2-weighted parasagittal MRI image of a patient with os odontoideum and mild compression of the upper cervical spine. This patient presented with transient quadriparesis. Lateral radiograph of a dystopic displaced os odontoideum 6 months after posterior wiring. After the wiring was performed, the patient had a solid arthrodesis with no motion on flexion and extension. Her neurologic symptoms resolved despite the failure to obtain a reduction. Had she continued to have severe symptoms, anterior odontoidectomy could have been considered. Lateral radiograph demonstrating fixation of a reduced os odontoideum with Magerl screws in a patient with an incomplete posterior arch of C1. Lateral radiograph demonstrating fixation of a reduced os odontoideum with the Harms technique. Disclosure: Received royalty from Stryker Spine for trauma plate design; Received expenses/travel from AAOS for incoming editor aaos now; Received expenses/travel from NASS for board membership; Received grant/research funds from Globus for independent contractor; Received grant/research funds from Relievant for independent contractor.